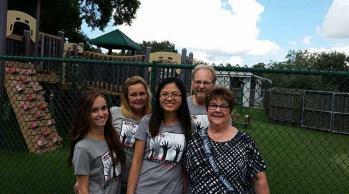 This week a group of RMC Property Group employees spent the day volunteering at the Easter Seals Florida Murray Child Development Center in Tampa. Easter Seals has the nation’s largest network of inclusive child development centers for infants through preschool (0-5 years of age). In these settings educators meet the needs of students (with and without disabilities) through the use of specialized approaches and instruction to prepare preschoolers for entry into the school system or to support current students to achieve at their highest level. With a focus on reaching developmental milestones through hands-on learning, services are provided in a natural environment to promote growth and success.